With an increasing number of clients looking to social media to find a salon for a beauty fix, its no wonder that Pinterest is the fasting growing search engine to find the answer. It's more important than ever to have a strong presence in the social media world, with an even stronger presence on Pinterest. Many Salons have Facebook and Twitter pages, but have you thought about using Pinterest to boost your web traffic and sales? Let’s face it, women are all over Pinterest looking for ideas they can use for the perfect hair design. You can be the one pinning those great ideas! You don't need to be a top pinner to attract salon clients to your website, but if you know a few basics, standing out from the crowd will be alot easier to point potential clients in the right direction. Here are some tips that you can apply to your salon business to start a Pinterest following. Gone are the days of saving paper magazine ads or photos of dream cars, vacation destinations, designer wedding dresses and trendy home decor, and pasting them in a notebook. People are now saving images onto one of their categorized boards. And the best part is- The majority of Pinners are in a "purchasing frame of mind." Either they're pinning what they plan to buy now, or things they intend to buy in the future ( i.e., a bride who pins wedding hair styles to her wedding themed board). Create a Board and enter the name you've decided on. Just like the title of a web page, make sure it reflects what the board will be about, and don't forget to include an important keyword. Don't take board names lightly. They are indexed by Google. This is key to ranking. Note: The board name field allows for 180 characters but the visual limit (what users can see before clicking through to the full board) is only about 20 or so characters. 3. "How Often Should I Pin? "- This question is asked often by pinners. While there is no exact formuls for Success, some people will tell you to share at least one new pin every week. However, if you really want to gain a competitive advantage, once a week wont cut it. I suggest that when starting out, plan to pin and repin anywhere from 10-30 pins daily. Pin two of your own pins for every 8-10 you curate. Keep consistently putting your salon business and your brand out there to increase your audience. 4. Link EVERY Pin to a Page on Your Website or Blog- This makes it easy for people to get more information. – This gets people to your site, checking out what you have to offer, and increases your web presence. 5. Create Pins Around the Most Popular Salon Topics – Showcase the latest hair design, holiday Up-Do's, Bridal Hair, Brides Maid Hair etc. Make your business the authority for knowing the hottest trends for Salons. Apply these tips to your Salon business, and you’ll be on your way to more website traffic and leads and even more salon bookings in your zip code! 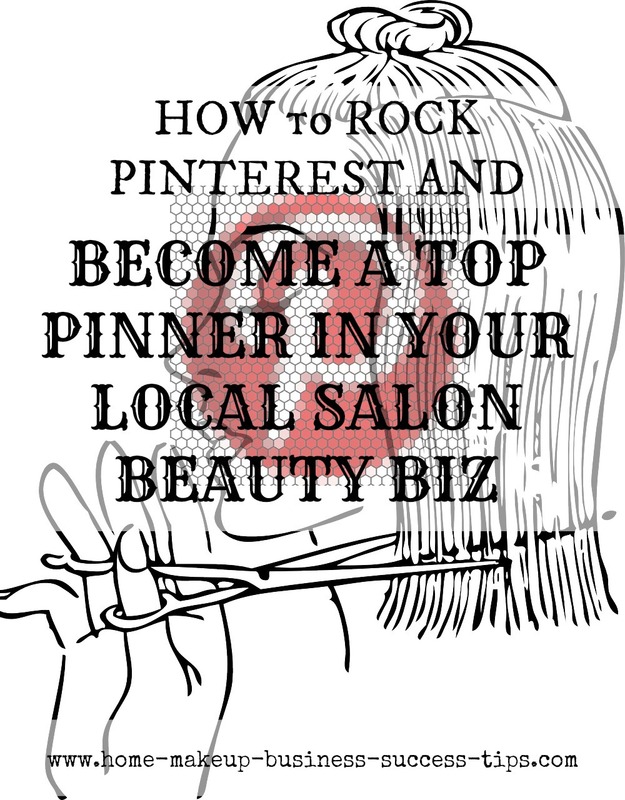 What could YOU do with a Pinterest page for your Salon business? FYI- Invite your customers to Sign up for your Blog: You want to stay in touch with them to keep the momentum going. Have a Local Salon Beauty Business Tip Success Story? Beauty Biz expert, includes Pinterest VA and ​Beauty Biz copywriter. ​My AWAI ​training​including, Social Media Marketing, e-mail writing,​ and SEO has increased my knowledge of writing even further. To keep my skills sharp, I am here for you! Order Now!